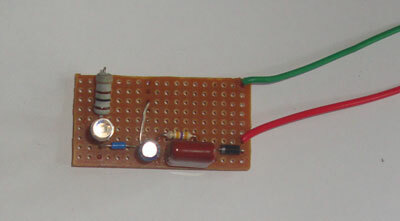 The circuit is directly powered from the 230V AC. 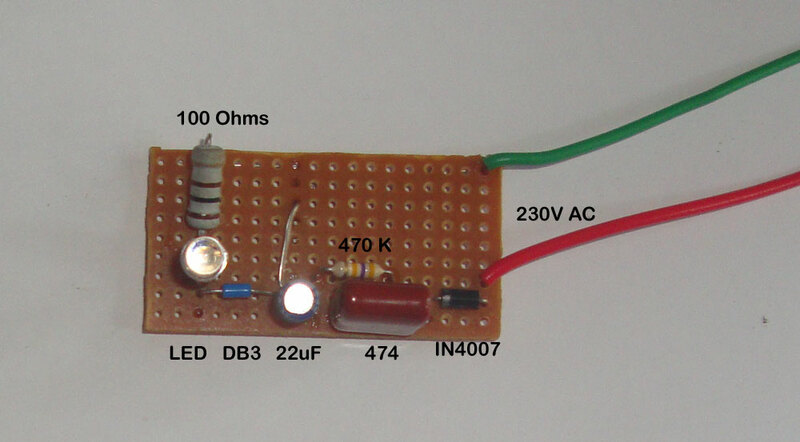 474 J capacitor drops the high volt AC to low volt AC which is then rectified to DC by the IN4007 diode. The 22 uF capacitor performs two functions. It smooths the DC from the IN4007 diode and its charge / discharge cycle switches on / off the Diac DB3. Diac DB3 is making the LED flashing. It is commonly used in Pulse generator circuits to trigger SCR and Triacs. It is like a diode but conducts in both directions and hence it has no polarity. When a low voltage less than its threshold reaches the Diac, it remains non conducting and when the threshold voltage increases, it conducts and passes a low voltage a pulse. Warning! 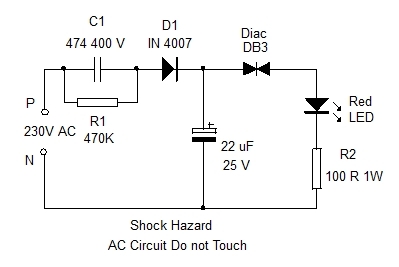 This circuit uses 230 VAC and exists at Lethal potential that can give a Fatal shock if touched. Build this circuit only if you are competent to handle high volt circuits. If you are a beginner and not familiar with AC circuit, leave this for safety. Take all adequate safety measures during its testing. Test only after closing the case. Troubleshoot only after removing from the Mains. So normally at power on , the LED will be off since the Diac is not conducting. When the 22 uF capacitor charges and when its voltage increases, Diac fires and conducts. The 22 uF capacitor discharges via Diac and LED lights. When the 22 uF capacitor discharges the threshold voltage for the Diac decreases and it turns off. 22 uF capacitor charges again and Diac conducts to light the LED. This cycle repeats. 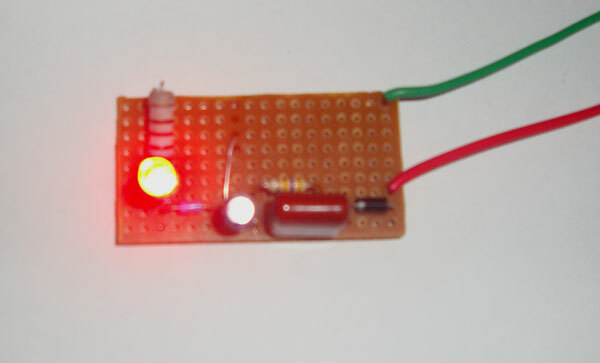 The Flashing rate of the LED depends on the charging / discharging time of the capacitor C2. That is, lower value such as 10 uF gives fast flashes while 100 uF gives slow flashes. You can select 22 uF or 47 uF capacitor for moderate flashing rate of one per second. See that 470K resistor which is the bleeder resistor to remove the stored current from the 474 capacitor. It if is not there, the stored current in the capacitor can give a shock, even if the circuit is removed from mains for trouble shooting. So it is must. 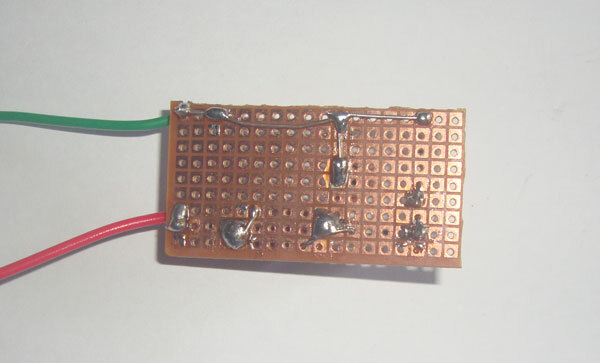 Assemble the circuit on a small piece of common PCB and enclose is a small plastic case. Fix the circuit inside the switch box with the socket for the Electric Iron / Heater. Connect the wires of the circuits with the Socket points so that when the switch to the socket is turned on, LED starts flashing. LED should project out from the cover of the switch box. Remember, you are working with high volt AC and it can give a fatal shock. Build this circuit only if you are competent to work with high volt AC, otherwise leave it. Do not test or trouble shoot the circuit while it is connected to mains. Take adequate safety measures like wearing gloves, slippers etc before working with AC. Always switch off the mains, before opening the switch box.